The first two new markets should be launched by the third quarter of this year. Soon-to-be-issued token, LUK, will be the medium by which some blockchain startups will receive investments. 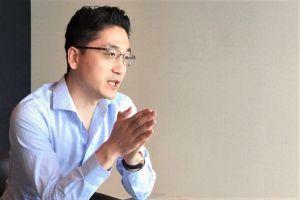 South Korean major cryptocurrency exchange Upbit is looking to expand their business beyond their current markets of South Korea, Singapore, and Indonesia - several new markets should launch by the end of 2019, Alex Kim, CEO of Upbit APAC, which is responsible for the Asia-Pacific region, told Cryptonews.com. Moreover, the investment subsidiary of the exchange’s parent company, Dunamu & Partners, has KRW 80 billion (c. USD 71 million) ready to invest into various blockchain startups over the next two years. Upbit hails from South Korea, and has started service in Singapore in November 2018 and in Indonesia in January 2019. This is far from the end of their spread throughout Southeastern Asia (SEA): “We’re in the process of procuring relevant licenses in other SEA markets, including Malaysia and Thailand, and we expect to launch in 3~4 additional markets by the end of the year,” Kim explains. The first two markets should be launched by the third quarter of this year, he adds. “We think the key to sustainable success is to grow the blockchain ecosystem by investing in blockchain startups and providing them with development solutions to grow their businesses. This will ultimately allow Upbit to better serve the role of connecting high-quality blockchain projects to investors,” Kim adds. The exchange has also just launched a blockchain service platform called Luniverse, and its soon-to-be-issued token, LUK, will be the medium by which some blockchain startups will receive investments through Dunamu’s other subsidiary, Lambda 256. A total of 3 billion LUK should go towards those investments at a rate of KRW 5.5 billion (around USD 5 million) per company. The value of LUK is not fixed yet as they aim to release a white paper in April. Right now, Upbit is one of the largest South Korean crypto exchanges, but they have had their share of issues due to the regulatory uncertainty surrounding the nascent industry there. Currently, the exchange has around 1.2 million users - this number is unchanged from last year. “This is due to regulatory issues in Korea, which makes it practically impossible for new Korean users to trade with fiat on Upbit,” Kim explains. Upbit has problems that stem from South Korea’s strict laws, where one of the biggest ones is Korea’s regulation regarding overseas bank transfers. Another serious issue for exchanges are market manipulation tactics, especially wash trading. “This is obviously a major issue for cryptocurrency exchanges, which is why objective organizations such as the Blockchain Transparency Institute have been publishing their own rankings that exclude any trading volume that can be considered wash trading. Upbit has ranked extremely high in these rankings, which shows that our trading data can be trusted,” a spokesperson told Cryptonews.com. 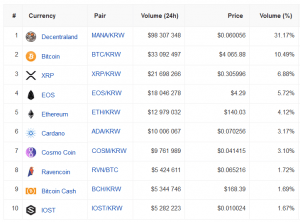 As of the time of writing, Upbit has a daily trading volume of USD 315 million and ranks as the 16th largest exchange, according to coinpaprika.com. 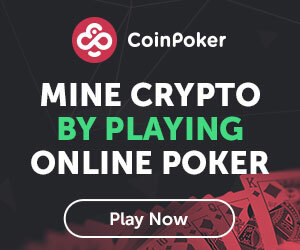 Source: coinpaprika.com, March 29, UTC 4:53 PM. The problem with wash trading ties into the allegations of fraud against three senior staff members of the exchange. Back in December 2018, the Prosecutors’ Office of the southern district of Seoul has accused the members of using a fake corporate account to make equally fake orders worth KRW 254 trillion (around USD 226.2 billion) to inflate trading volume figures and attract more customers to the exchange. Additionally, they were charged with selling 11,550 BTC to customers to the tune of KRW 150 billion (around USD 133.8 million) through rigged transactions. All of this is said to have occurred over a time period between September 24th, 2017 to December 11th, 2017. Meanwhile, the prospect of decentralized exchanges will depend on what additional value they can deliver compared to centralized and regulated exchanges, the CEO says. "I believe the whole blockchain industry needs to prove its value with actual use case," he concludes.